Move over, white diamonds: Colorful gemstones are trending big time as more and more couples choose “non-traditional,” unique engagement rings that pop with personality and pizazz. Don’t get us wrong: We are all for the tradition of wearing diamonds to signify your love–diamonds that are conflict-free and fairly traded, that is, the only kind you’ll find in our collections from Rosados Box. And diamonds paired with white metals have endured for generations as the most popular style for engagement and wedding rings. Yet, non-diamond precious gemstones have through history graced the engagement rings of the rich and powerful. Napoleon proposed to Josephine with a sapphire, John F. Kennedy gave Jackie an emerald. Prince William, his mother’s blue sapphire to Kate. And from celebs to civilians, the color trend continues. When it comes to self expression, there is nothing quite as eye-catching as a ruby, sapphire, emerald, or other hued gemstone to reflect the love that is uniquely yours — or that states it as strongly! Aside from their beauty and uniqueness, non-diamond gemstones can also be (surprisingly) more affordable than diamonds, just as durable and, when grown in a lab, 100% conflict-free. How to ensure your gemstone is conflict-free. The world’s best-known red gem, the ruby was worn in Medieval Europe to promote health, wealth, and wisdom. Large, fine-quality rubies are extremely rare and valuable. The most expensive ruby color is a deep red. Other colors include light pink, purple, or orangy red. Rubies are found in Burma, Thailand, and Vietnam. The hardness measures 9 on the Mohs scale. At 9 on the Mohs scale, the sapphire is second in hardness only to a diamond. Blue sapphires are most popular (the blue hue is caused by trace amounts of titanium and iron) but the gem comes in many other colors including green, purple, and yellow — as well as colorless.. Known to be the favorite stone of history’s most famous lover, Cleopatra, the emerald is a beryl mineral whose hue is caused by trace amounts of chromium and sometimes vanadium. Emeralds rate between 7.5-8 on the Mohs scale and so are not as “tough” as diamonds and should be worn with extra care. See more green-hued gemstone engagement rings from Rosados Box. This gem, a variety of the mineral beryl (which also includes emerald and aquamarine), is named for the American financier and gem lover JP Morgan after a new source of pink beryl was found on the island of Madagascar in 1910. Brazil is now the largest source of Morganite. Its subtle hue ranges from pink to orange-pink and is caused by trace amounts of manganese. The hardness measures 7.5-8 on the Mohs scale. Like emerald, aquamarine is a type of beryl mineral, often embedded granite, and can be found in nature across the western US, as well as in South America and Africa. Known for its icy bluish hues in a variety of shades, the aquamarine is usually blessed with very few if any imperfections. The intensity of this stone’s color is directly correlated with its depth; the larger the stone, the richer the color. The hardness measures 7.5-8 on the Mohs scale. With a hardness of 8 on the Mohs scale, this silicate mineral ranges in colors from clear to light blue to pinks, oranges, and the rare reddish imperial colors. Brazil is one of the largest producers of topaz, which is also found in nature in parts of Russia, Europe, the Middle East, Australia, and North America. We especially love blue and pink! 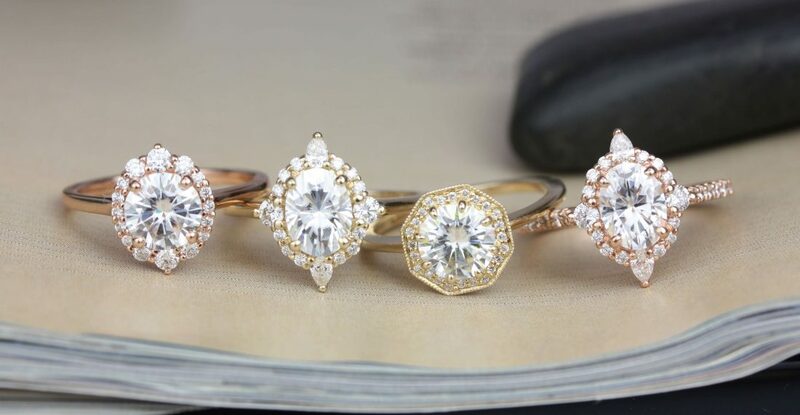 The number-one diamond alternative of choice for socially conscious consumers, moissanite is a natural mineral composed of silicon carbide that is made entirely in the lab and offers a similar sparkle, hardness, and durability as a diamond but is less expensive. See our extensive Rosados Box collection of moissanite rings. Learn more basics about gem differences.